St. Augustine Beaches News Journal August 2013 6 S. Gary Snodgrass, Mayor City of St. Augustine Beach, FL Message from the Mayor St. Augustine Beach Professional Packing, Shipping & Mailing Service Center (904)460-0022 With Safe ShipYou Have Options For info & directions please see www.safeshipstaug.com The beach has been a very busy place so far this summer. Both our local friends and our out of town guests are enjoying our newly re-nourished beach along with The Wednesday market and the 11th annual Music by the Sea Concert Series. On Wednesday as over 1600 people enjoyed the music of The Falling Bones. In August we'll enjoy music from popular bands Mid Life Crisis, Jimmy Parrish and the Ocean Waves, Smokin Mirrors and Big Lonesome. Bring your cooler and your beach chair and join us every Wednesday Night at the St Johns County Pier Pavilion. A complete schedule of bands and restaurants is available on our website at www. thecivicassociation.org In other happenings on the island you may want to check out these events coming up in August... Saturday August 3rd until 10 Amphitheater. Live music, food, has done remarkable work to help provided quality medical care for people in Kenya. Kijiji works with DaVita Medical Missions to provide much needed dialysis equipment and treatment to those in need. The event is being organized by Martin of the Kenya Coffee. Many of us know Martin from his work at our local Farmer's Markets. For more information on the event please visit www.kijijiinternational. org or call 904-554-1073 Tuesday August 6th National Night Out presented by the St Augustine Beach Police Chief Robert Hardwick and his team will be at the St Johns County Pier Pavilion food, drink, exhibitors, child safety education information, DNA kits, emergency vehicles, law enforcement personnel, Chief Robert Hardwick has enlisted the help of other law enforcement agencies, local businesses including the Sunset Grille and The Oasis. The St Augustine Beach Civic Association will again be working with the Police Department as a sponsor of the annual bicycle giveaway. The event runs from 6 until 8 pm. While we at The Civic Association share information and try to refrain from getting involved in politics, sometimes that is just not realistic or possible. As President of the Civic Association I have sent a letter of complaint to Glen Hasting so the St Johns County Tourism Development Commission regarding the TDC's grant process. Many local events are funded by grants from the TDC. The grant money comes from a bed tax on hotel rooms rented here in St Johns County. The 32080 zip code generates the largest percentage of bed tax revenue. The Civic Association is concerned about the TDC Funding Panel decision not to fully fund out annual free concert series and we are upset that the City of St Augustine Beach was denied funding for the Beach Blast Off Festival that historically draws thousands of visitors to our community during a time of the year that is traditionally slow for our hotels and restaurants. Our 32080 zip code is apparently good enough to raise money for the TDC but for some reason is not being given the same consideration as other zip codes as money is doled out. Please visit our website at www.thecivicassociation. org to see the entire letter. Thanks to all who support our organizations effort to improve our quality of life and the experience of visitors to our community. If you are not a member of the St Augustine Beach Civic Association please visit our website and become a member today for just $10. Your membership supports our great local programs and you'll receive discounts at over 80 businesses here on the island. Questions, comments? Please e-mail me at sabcivic@yahoo.com See you at the beach! In early 2013, THE ART STUDIO of St. Augustine Beach opened its' doors to the public. Located at St. Johns County Pier Park in the west end of the historic Cultural Arts Center Building, this venue hosts art classes and provides gallery space exhibiting the works of local artists. The public is welcome to visit the studio whenever the OPEN sign is displayed on the door. Several years in the planning, with donors and countless hours of volunteer efforts, the space continues to evolve as a charming small community based art studio. This is a dream come true for all in the St. Augustine area. Dues are $20 per year. Fifteen hours of Open Studio time is provided for members and an opportunity to display art as space permits. Please contact Paul Slava, president of the Board of Directors for membership information (pslava@comcast.net). Our September column will be devoted to the future project of a clay and sculpture studio with outdoor sculpture garden. The small historic "outbuilding" located between The Cultural Arts Center Building and the Bocce Ball courts will be transformed into a teaching/working center for clay and sculpture. A Halloween fundraiser to support this effort is being planned for Friday, October 25th. Plan to join the party for "The Haunting at The Art Studio ". Please visit our website at www.beachartstudio.com for further information on The Art Studio. The little studio that could........and did." The Art Studio of St. Augustine Beach by Jan Heusdens heusdensjan@yahoo.com www.beachartstudio.com Greetings fellow citizens! Here are some comments about important developments within our City: As outlined previously, the City will formally review its Charter for possible Charter changes, if any, as approved by the Commission will be presented for a general vote of the Citys registered voters in the fall of 2014. A Charter Review Committee composed of citizens selected recently by the Commission has been established to review the Charter and The Charter Review Committee will hold will be facilitated by Ms. Marilyn Crotty, Director, Florida Institute of Government, University of Central Florida. All Charter Review Committee meetings, which will be held at City Hall, are open to the public. meeting dates and times. Police Department Report At its July 1, 2013 meeting, the Commission received and formally approved a comprehensive report from Police Chief Robert Hardwick covering an assessment he had conducted of the Police Department, at the request of the Commission, including its policies, procedures and practices, its mission Since his appointment in January 2013, Chief Hardwick has implemented a number professionalism and effectiveness of the agency and to restore trust and credibility of the Citys law enforcement agency. The Citys Police Department will retain a fully staffed local community policing effort augmented by services provided This approach is designed to ensure the safety and security of citizens and visitors. Importantly, the plan going forward provides a pathway to ensure that the Citys Police Department becomes a fully State accredited law enforcement agency by January 2015 or sooner. Ongoing City Projects 2nd Avenue/10th Street Drainage Project This project calls for the piping of the 2nd Avenue ditch from C Street north to 10th Street, and then west along 10th to a ditch on the east side of property owned by Runk Corporation. The project will facilitate the removal of storm water rain. Projected costs: $593,000. With brick pavers, the City will improve the plaza at the northeast corner of A1A Beach Boulevard and 8th Street. Projected costs: $40,000. Solar Panels The City is exploring the possibility of placing solar energy panels on the City Hall roof. This could generate enough electricity to provide for power for lighting and heating/cooling. More information on this effort will be provided at a later date. At a special meeting on Monday, July 29, the City Commission will review the proposed Fiscal Year 2014 budget, and will make decisions concerning such matters as employees pay adjustments, medical health care plan for employees, major projects and purchases, such as vehicles, and the tentative property tax millage for FY 2014, which will begin October 1, 2013. Two public hearings on the proposed budget will be held in September. The public is invited to attend all budget meetings. We value your inputs and ideas for making our City a better community. For all of us, its the place we call home. Best regards,S. Gary Snodgrass, Mayor. St. Augustine Beaches News Journal August 2013 7 St. Augustine Beach City Manager Financial Focus Edward Jones 4108 A1A South St. Augustine, FL 32080 www.edwardjones.com MAKING SENSE OF INVESTING that her retirement question shouldnt be answered by a call center. Connie Reep Financial Advisor Ben Reep Financial Advisor Dont Get Trampled The focus of my past two essays has been mainly on me, myself and I, that unholy trinity of the ego and the preeningly self-absorbed. Its time to give you a likely welcomed break from all that feather stroking. Well do this by providing you with information about topics that you might actually be interested in, or something to that effect. I guess that makes some sense. So, with your approval, Ill bring you up to date on a few of the many, and thus too numerous to count, matters that concern our little government in paradise here. Because the information exceeds the print space that the editor so generously gives me in a single issue of this, your favorite monthly newspaper, my update will have to be in two parts. year (FY) will begin on October 1, 2013, and end on September 30, 2014. Please FY for Floridas cities and counties isnt the same as the calendar year, or why the June 30th. Like stuff, such apparently just happens, with the cause lost in the mists of the past. The citys well-experienced Finance Director, Ms. Melissa Burns, begins June. She meets with the department heads to learn what they regard as essential for their respective budgets; she notes in various sources trends in revenues and the newly mandated expenditures that the Florida legislature has imposed. In late June or early July, she receives revenue estimates from the state for key sources of money, such as the half cent sales tax, and from the countys property appraiser the estimated assessed value of all privately-owned real estate in the city. This information is crucial, because property taxes are the citys main revenue source. Ms. Burns can then determine how much money the city will receive at the current millage decrease is possible or an increase needed in order to provide the city with enough income to meet its expenses in the millage levy is 2.3992 mills, or $2.3992 for every $1,000 of the assessed value of a residence, commercial building or vacant lot or tract of land. Thus, if the property appraiser determines that the value of your house is $200,000 after all the allowed exemptions have been deducted, then your city property tax will be: 200,000 divided by 1,000 times 2.3992, or $479.84. I cant say at this time what millage level the city commission will adopt for decision are how much revenue the city will receive from other sources, and the costs of fuel, electricity, insurance, vehicles, major items of equipment and major construction projects. On the budgets expenditure side, the commission will need to make decisions concerning employee pay raises, whether changes in the employees health insurance plan are needed to reduce costs, and whether the city can afford, for example, to buy new vehicles or do certain construction projects. The city commission will review the proposed FY 14 budget at a special meeting on Monday, July 29, 2013 at 7:00 p.m., in the city hall, and will at that meeting set the tentative millage. The property appraiser will include this information in the notice thats mailed in August to all property owners in the city, along with the on the budget. This is usually held at the city commissions regular meeting on the second Monday in September at 7:00 p.m. Citizens are invited to comment on the proposed budget at these meetings and any other the commission may hold concerning the budget. The public can review the budget at citys website at www.staugbch.com. Citizens with questions about the budget 2122, or send an email to the Deputy City Clerk, Ms. Cathy Benson, at sabadmin@ cityofsab.org. 2. Off-Beach Parking Study. An entire essay could be devoted just to two questions: whether its possible to have enough public land for off-beach parking in a barrier island city; and whether the city alone should be responsible for paying the costs to construct such parking areas when the beach is a recreational magnet for visitors from areas far beyond the citys boundaries. But, for the present, Ill just highlight a parking study that was prepared for the city by a county consultant hired to study the availability of parking areas along the countys entire coast. The city paid $6,200 for that part of the study that was an inventory of off-beach parking within the citys limits. The consultant described several parking areas that already exist, such as the pier park and the east end of Pope Road, and suggested (continued on page 11) UPDATE I Is it bizarre to believe your retirement concerns should be addressed by an actual human being not a menu of options? Of course not. Thats why our in neighborhoods like yours, not a call center in who-knows-where. So face-toface attention is a given. Join the rearly 7 million investors who know face time and think time make sense. Every year in early July, thousands of people run with the bulls in Pamplona, Spain. While the event is exciting, it is also hazardous, and many runners have gotten badly injured over that running with the herd is dangerous to you, too because if youre constantly following what everyone could end up getting trampled. The urge to run with the herd, or follow the crowd, may have been hardwired into our psyches, according to anthropologists. In prehistoric times, running with the pack may have helped people minimize danger food. But today, there are far fewer rewards for following a herd mentality especially in investing. For example, consider what happens a period of volatility. Virtually every time this happens, many investors the shiny yellow metal will always be valuable and that its price will never drop. Yet, the fact is that gold prices, of gold-based investments can be quite risky in their own right. What other follow the herd movements should you avoid when you invest? For one thing, try to stay away from feeding frenzies. If you look back about 15 years ago, you may remember the buzz surrounding speculative technology stocks many of which were companies that had futuristic names but lacked some business strategies. For a few years, the prices of these companies soared, but in 2000 and 2001, the dot-com bubble burst, splattering investors with big losses that were either irreversible or, at the least, took years from which to recover. The herd mentality often applies even when investors know the right moves to make. To illustrate: One of the most basic rules of investing is buy low, sell high and yet many investors do the exact opposite. When prices drop, they sell, so that they can cut their losses even though they may be selling investments that, while temporarily down, still have strong potential. On the other hand, when an investments price has shot up, these same investors will often keep buying more shares, hoping to reap even bigger gains even if the investment has now become quite expensive, as measured by the price-to-earnings ratio, and has little upside potential remaining. Instead of emulating other investors, and create a viable strategy for achieving them, taking into account your risk tolerance and time horizon. Look for quality investments and hold them for the long term. Dont be discouraged by the inevitable market downturns, but be ready to adjust your portfolio as needed. Above all else, be patient and disciplined, always keeping your eye on your ultimate objectives. It can feel comfortable when youre in the midst of a herd but it can lead you to places where, as an investor, you dont want to go. Steer clear of the crowds and go your own way. 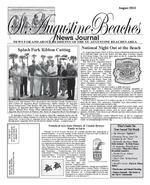 St. Augustine Beaches News Journal August 2013 9 Beaches Bistro By Paolo Pece, Cafe Atlantico cafeatlantico@comcast.net Turkey Breast Milanese INSURANCE NETWORKFIRST FLORIDAFIRST FLORIDA IS ST.JOHNS COUNTYS PREMIER HOMEOWNER INSURANCE AGENCY St. Augustines Oldest Continuous Insurance Agency DESIRED DWELLING COVERAGEYEARLY PREMIUM ADDL DISCOUNTS AVAILABLE $200,000...............................................$695...............................home/auto discount up to 20% $250,000...............................................$875...............................home/auto discount up to 20% $300,000.............................................$1044...............................home/auto discount up to 20% $350,000.............................................$1214...............................home/auto discount up to 20% $400,000.............................................$1384...............................home/auto discount up to 20% $450,000.............................................$1563...............................home/auto discount up to 20% $500,000.............................................$1723...............................home/auto discount up to 20% $550,000.............................................$1892...............................home/auto discount up to 20% $600,000.............................................$2054...............................home/auto discount up to 20% $650,000.............................................$2230...............................home/auto discount up to 20% $700,000.............................................$2350...............................home/auto discount up to 20% $750,000.............................................$2569...............................home/auto discount up to 20% $800,000.............................................$2689...............................home/auto discount up to 20% $850,000.............................................$2812...............................home/auto discount up to 20% $900,000.............................................$2893...............................home/auto discount up to 20%Includes $300,000 Liability Coverage, $1,000 Medical Payments to Others and a $2,500 AOP Deductible. Based on 2009 Masonry Home St. Augustine Beaches News Journal March 2013*HIGHER LIMITS OF COVERAGE AVAILABLE*Please review this proof of your ad closely as it will be printed as it appears here unless corrections and/or changes are sp ecified by you on this proof. If there are any typographical errors or errors of omission, please return information to our office as soon as possible. This proof was created based on the information provi ded to our representative by you or a representative of your company. We cannot be responsible for content and copy of your ad except as noted on this proof form. ______________________________________________________________________________________________ Approved Date Approved with noted changes Date Contemporary Italian Grill 904-471-7332 www.cafeatlantico.net Dinner Mon.-Sun. 5 p.m to Closing I particularly enjoy the zest of a Barbera with this dish. It's grape from Piedmont the makes a good everyday table wine, with lively hints on the palate. TURKEY BREAST MILANESE 4 Turkey breast cutlets 2 eggs, beaten lightly toasted in the oven 3/4 cup butter (halve this if you use a non-stick pan) Sprigs of parsley for garnish Lemon wedges if desired Flatten the cutlets out between the palms of your hands, pat them dry, salt them lightly, dip them in the egg, dredge them in the bread crumbs, pressing down to make sure the crumbs stick, and shake them gently to remove excess. In the meantime melt the butter in a skillet large enough to contain all 4 cutlets at once, and when it begins to crackle add them. Cook quickly, turning once so both sides brown, and serve hot, garnished with parsley and with the lemon on the side for those who want it. The next time you hear the word By Jane Tucker, First Florida Insurance Hurricanes And Inland Flooding First Florida agents invite you to First Florida to discuss your current certain you have the absolute best rate TEMPLE BY THE SEA 2055 Wildwood Drive, St. AugustineServices: First & Third Friday Evenings of the Month at 7:30 p.m.Rabbi Mark N. Goldman A Reform Congregation904-819-1875www.templebetyam.org T emple Bet YamReach The Beach By U.S. MAIL! The Beaches News Journal reaches thousands of homes in the Beaches area by U.S. Mail. By Rob Stanborough PT, DPT, MHSc, MTC, CMTPT, FAAOMPT First Coast Rehabilitation (904) 829-3411 St. Augustine Beaches News Journal August 2013 14 Master Compensator a person with exceptional skill at a certain becoming we do it? The Limp Master e The Mother Master The Robot Master The Sitting Master Rob Stanborough is a physical thera author of Myofascial Manipulation:Theory rd Manual Therapists and has presented on the topic of soft tissue dysfunction in a Fresh, Local Seafood Prepared the Way You Like it! Breakfast: Saturday & Sunday 7:30am-10:30am Lunch & Dinner: 7 Days 11am-9:00pm Early Bird Specials: M-F 3:30pm-5:30pm St. Augustines Best Casual Oceanfront Restaurant GRILLED, FRIED, STEAMED, BROILED, SAUTEED or BLACKENED (904) 471-8700 45 Cubbedge Rd. Crescent Beach www.southbeachgrill.net Open For BREAKFAST Saturday & Sunday 7:30 a.m. to 10:30 a.m. Join Us For and more! Residential/Commercial Prompt, Reliable Service Licensed & Insured Call Us At 794-7001 Fitness room Phone: 904-471-0909 site, featuring ten outdoor clay tennis courts with 7 lit for night play., Gazebos are located between courts with seating and water coolers. Our members enjoy easy court access, league play, plus group and private lessions conducted by our Tennis Pro. and our Pro can string your racket by hand to ensure your equipment is at its best. includes stair-steppers, cycles, rowing machine, treadmill, and free Massage Therapy is available. Enjoy the sense of well-being that only an expert therapist can give, a convenient and perfect ending to your workout. Also enjoy the whirlpool, steam room for post workout relaxation. Atlantic Beach & Tennis Club has plenty of water-based amenities to delight the entire family. The heated indoor pool is perfect for swimming, weightless exercise, aching joints or just relaxing. There are Aquacize classes for the best in Arthritis Therapy.